I have never adjusted the fin on my ski in my entire life. 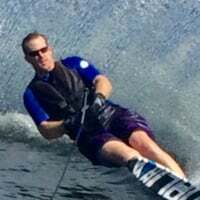 I ski in Minnesota where the water temperature during our ski season changes from 33 degrees to over 80 degrees. I often have times during the season where I struggle and feel like a fin adjustment might help, but in the end I think it is just a mid-season slump and I am doing something wrong that I usually work out over time. I finally switched over to a 66 inch 2010 radar strada last year. It I set to stock settings (as far as I know). Can anyone comment on how they decide when it is time to make a fin adjustment? I have read some articles about the benefits of adjusting to compensate for cold water, but I’ve never done it. Any tips would be greatly appreciated. Washington water temp. goes from the high 30's to the high 70's on this (West) side of the mountains, and I stopped playing the fin "tweak" game. Spend more time stacked, on the handle, and keep your vision up, and the results will be way better than a .005 adjustment of that silly fin. D3 skies have a good Pg for above seeing how to measure and set fins and boots. But with so many different boot companies ( hardshell, rubber, hybrids). I find their photo pointless as each has a different heel structure/build. Companies need to standardize a mark on the boot plates to measure from, not the boot structure. I would say with gradual warming up and cooling down of water temps, fin changes my just become frustrating. When I travel from FL to MN in July, I change things a bit but may not next time since I've gone to just a front ventral fin only. I think fin settings would help condition changes if they were ratical and rather instant like skiing cold water gravel bottom one day and deep warm muck bottom waters the next. This comes up every year. I asked the top 4 skiers at Okeeheelee (temps go from low to mid 50s to as high as the low 90s). None of them adjust their fin for water temp. Thank you Roger. Please repeat this as often as you can. There are many sound reasons why the Professor invented the adjustable fin and many practical applications. Just got off the phone with a top Big Dawg. Colder water below 72ish-boot forward, above 72ish-boots back. No fin adjustment. @WBL, stop down and ski and we will get you set on the right path. I dont adjust to temps but adjust to what I think is going wrong at any given time. I am never far off of my orig numbers but at times a bit forward or back helps the brain which helps the skiing. I adjust my fin when the ski is making my turns better on one side than the other. I can tweak it to try and make them as equal as possible. When setting up a new ski, I always start with the Factory Settings. Then start by adjusting bindings to get the TIP level on both side turns. Next is fine tuning the fin to get the feel I want at my shorter line lengths. Last is adjusting the wing. On both my skis, the Sans SR-2 and HO S-2, I use a Forward Mini Ventral at Zero Degrees and set the Rear Large Ventral at 5 degrees for water temps @ +80 F...6 degrees @ 70-80 F.. 7 degrees @ 65-70 F.....and 8 degrees below 65 F.. I also move the Powershell Bindings 1/8" FWD when water temp is below 70 F.
Some of these figures were recommended by Sans Rival. I find this keeps the ski feeling the same at all these temps. @Ed Johnson what's the difference you feel with the ventrals on the S2 vs standard wing? Requires less load, sustains speed better, tip stays down better off the apex, and helps to keep the ski from overturning.